There are several types of layers available depending on the type of graphics and artwork you are aiming to achieve: bitmap or vector. Bitmap Layers: Allow you to use bitmap graphics which are made of pixels on a grid that resemble tiny dots, which altogether make up the drawing you are creating or artwork you are importing. Bitmap graphics impart a more natural and soft look to your work. The colour is defined on a pixel-by-pixel basis. Vector objects consist of lines, curves, and shapes you can edit and transform using their control handles. Vector graphics are not restricted to rectangular shapes like bitmap graphics. You can place vector objects over other objects, and the object below will show through. 3D Layers: Allow you to manipulate imported 3D objects (.fbx). After importing 3D object into the Library, you can add it the Layers list to automatically create a 3D layer. Group Layers: Allow to group multiple layers that can consist of vector and bitmap layers. In the Thumbnails view, select the panel to which you want to add a new layer. Select Layer > New > Vector Layer or New Bitmap Layer. Click the Add Vector Layer or Add Bitmap Layer button in one of these areas: Layers toolbar, Layers list in the Stage view, or Layers panel. In the Thumbnails view, select a layer. Select Layer > Delete Layers. You can also show or hide group layers. When you do so, all of its sub-layers are shown or hidden, and the state of the Show/Hide icon on each sub-layer is respected. For example, if you hide a group layer that contains one hidden layer and two visible layers, all of the layers in the group are hidden. When you show the group layer, it will once again show one hidden and two visible layers because the visibility state of each layer is retained. NOTE: When merging layers, hidden layers will be excluded and left unmerged. 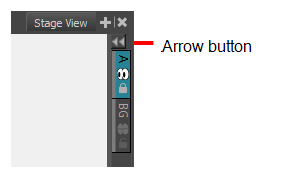 ‣ In the Stage view, click the arrow button to expand the Layers list. ‣ In the Stage or Layers view, select a layer. ‣ In the Thumbnails view, click the tab of a layer. ‣ Click the Lock icon of a layer.